Which of the following types of glasses shouldn't be worn when driving at night? Which of the following types of glasses shouldn't be worn when driving at night? Even if your helmet has a visor it’s likely that you will wear either prescription glasses (eventually) or sunglasses (to protect your eyes from those occasional sunny days we have in summer). This guide explains what to look out for when purchasing a glasses for riding your motorbike, or if you already wear glasses and are getting your motorbike licence, what you need to consider when buying a helmet (read our helmet buyers guide here, too). It is not good to use a heavily tinted or smoked visor because in low-light conditions (dawn, dusk, night, overcast, tunnels, etc), they restrict your visibility too much. If you are only ever going to use your motorbike when it’s bright and sunny, then go for a tinted visor. You can always have a spare clear visor, but it’s not as easy to stop and fix a new visor on your helmet as removing sunglasses. Riding with no eye protection is a ridiculous decision. If a bee or a stone hits you in the eye at 60mph it can blind you. The lenses on your glasses will provide protection and that’s why they need to be impact-resistant, shatterproof polycarbonate with 100% UV protection preferably in a lightweight nylon frame. If you want to use polarised lenses they will help reduce glare on really bright days. If you primarily ride in dull, overcast weather some orange or yellow lenses will help improve clarity and contrast. 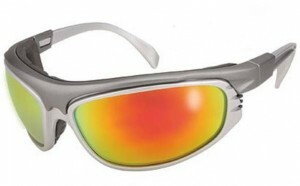 Lightly tinted yellow glasses are fine for night riding, but other tinted glasses are not. If your glasses support interchangeable lenses then you can get as many colours as you want and, of course, they should be able to accept prescription lenses that are tinted, and even lenses that adjust their tinted with the level of sun. The bigger the frames the more likely they are to not fit on your face without being pushed in some direction either by the padding above your brow or the padding around your cheeks (if you have a full face helmet). If this happens it will be uncomfortable over time. Bigger lenses will provide less chance of blind spots caused by the frames which could block the view of your instrument cluster (rev counter, speedo, etc) and warning lights. If you are using a half helmet (which isn’t recommended as they provide minimal protection), you might want to get a retaining strap, too. The thicker the arms the more your peripheral vision will be blocked; your peripheral vision is already a bit blocked by wearing a helmet. Arms should ideally have some kind of padding or they will tend to be uncomfortable on your temples and behind your ears. Padding around the eyes can help with condensation problems and also cushions against the helmet’s padding pushing the glasses onto your brow, cheeks or bridge of your nose. Helmets have interior padding and sometimes there will be a groove pre-cut to accept glasses arms. If not, one will eventually wear in, but it might cause discomfort initially. A full face helmet is recommended for the best protection but these will also be the most restrictive in terms of your choice of glasses. Ultimately, if you want excellent helmet comfort, contact lenses or laser eye surgery are the best options. Goggles with a retaining strap around the back can provide a lot of protection against flying objects and, because they tend to be sealed around the eyes, don’t suffer from condensation as much as glasses in a helmet can. 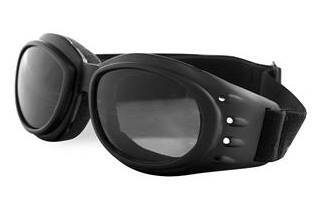 These particular goggles are a Bobster Cruiser II with interchangeable lenses. The retaining strap of the goggles goes around the helmet.